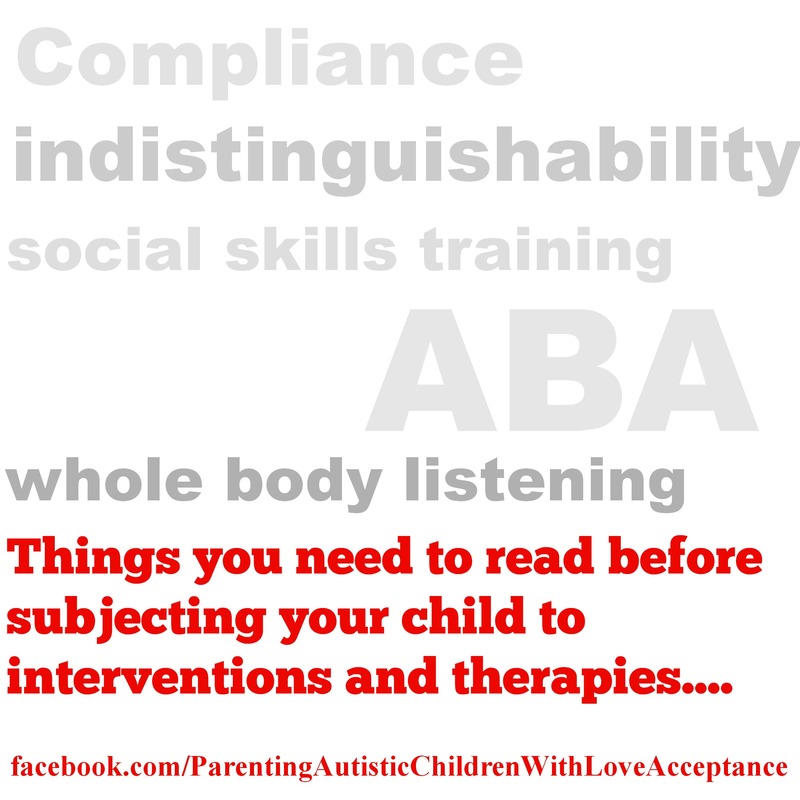 copied and pasted from Parenting Autistic Children with Love & Acceptance. There is an immense amount of pressure on parents to subject Autistic children to therapies and interventions which aim to coerce children into behaving according to social norms. Therapies with this objective, especially those which demand compliance, are dangerous and disrespectful to Autistic children. Below find a list of reading on the topic. Every single parent should read these posts before even considering allowing children to participate in any of these interventions. Kassiane is an Autistic adults who writes @ timetolisten.blogspot.com. She is a moderator here on PACLA and has been writing on this topic for years. Kassiane is considered to have successfully completed a Lovaas replication program–meaning indistinguishability. Becoming a Narcissistic extension of your Normal ‘betters’ does NOT improve your chances of societal inclusion. Sucking up to every Normie you meet does not cause you to become (by magical or other, unspecified means) ‘Normal’. It does cause you to 1) become scenery, I.e. disappear; 2) it does cause you to self-destruct (and hate yourself) and 3) it does result in further – and worse – victimization.